Ytterbium is named for the Swedish island of Ytterby, where this and several other rare earth elements were discovered in ore from a quarry. * It’s one of the few places where very old rocks are found near the surface. 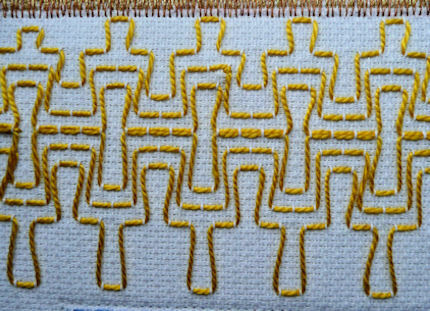 I chose to do some Swedish huck weaving, which is actually a form of embroidery done on a special fabric. 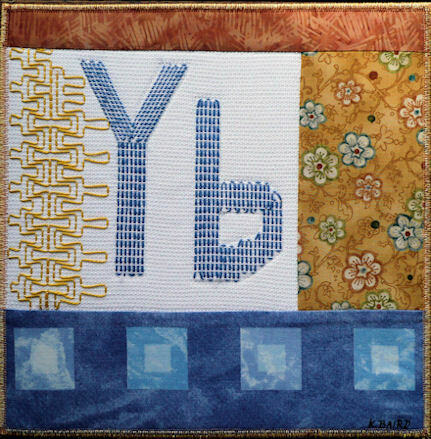 (read about it here) The block features Swedish yellow and blue, and should cheer up this corner of the Periodic Table! This entry was posted in Rare Earths: Lanthanide Series, View All Elements and tagged Kim B.